Since I love up tempo instrumentals with lots of percussion, I have many exotica records. But on many of these records there are only one or two songs that I play. As a genre it is highly overrated, in my humble opinion. Well, forget the humble. Since most of the best internet sites on exotica are made by Americans, the focus is also on American artists. But some of my favourite exotica LP’s come from Europe, and especially from England. The English orchestra’s in the sixties were more pop oriented than the American orchestras. The drums were louder, the brass was meaner and the overall sound was heavier. A good example is the orchestra lead by Chaquito. For a long time I thought Chaquito was from South America, but one day I realised that there are no pictures on any of the LP’s that I have of him. After reading the texts on the back of the sleeves I found out that Chaquito is a pseudonym of Johnny Gregory, who also made many records under his own name. 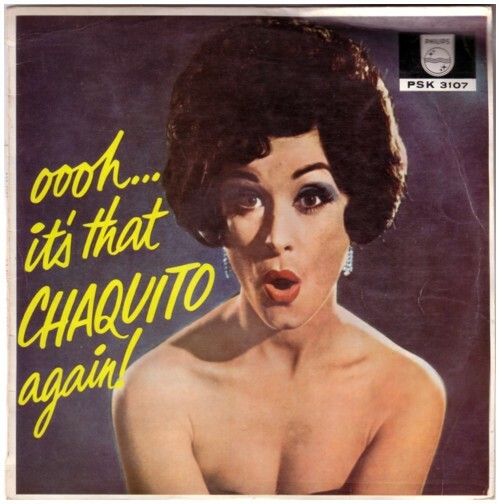 My favourite Lp is Oooh… it’s that CHAQUITO again! . Since music speaks louder than words, here is Chaquito doing a rip off version of Tequila , called La Fajanada . And if you are not convinced by this example of British exotica, here is another one, The private ay-ay-ay. Adore Chaquito especially with his quedo brass. Hope it comes out on CD soon.